A C11 two-cell church that was little altered before 1636 and lightly restored thereafter. 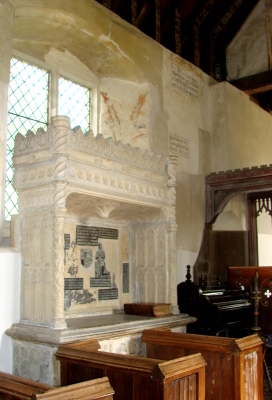 The fittings include a C15 screen, C16 monuments and C16 and C17 paintings. Burton church contrasts almost comically with the adjacent pompous classical mansion of 1831. There is no village and the benefice is said to have been united with Coates in 1510 (Dallaway II(1) p284). Its mediaeval dedication is unknown and the present one dates from 2003 (3 p10). 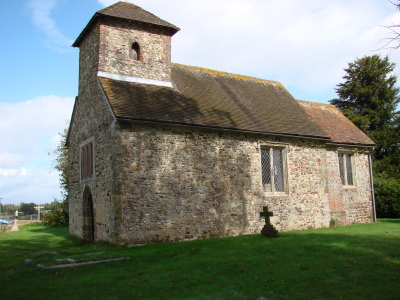 In 1851, the church had been closed for over 100 years (SRS 75 p192), though the repairs needed to re-open it were estimated at no more than £75 and worship did resume after a restoration later that year (3 p10). 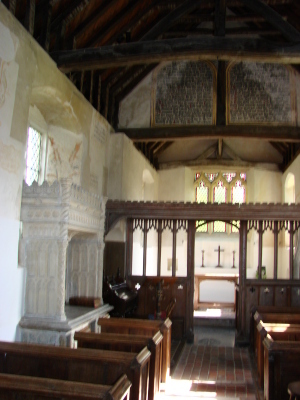 It has an aisleless nave and a chancel, angled slightly to the north. Such a plan, particularly taken together with the large quoins of the nave and some herringbone masonry in the north wall, looks C11. There is no chancel arch and the only early detail is the blocked low round-headed south doorway. It has been seen as pre-Conquest (e g Jessep p57), but is more likely late C11 – Steer plausibly suggests c1075 (3 p3). The west doorway, possibly C14, is is the only other feature older than 1636. Work then was undertaken for Bishop (later Archbishop) Juxon (BE p123), who attended Charles I on the scaffold. The west end was altered then, so if the doorway is C14, it is likely to be reset or altered. 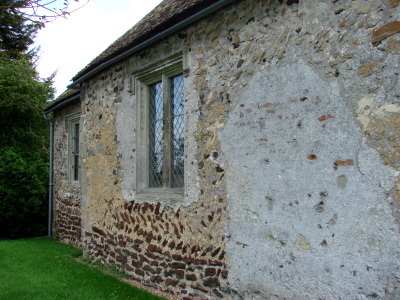 There was probably originally none in this position, since the head cuts into the outline of an earlier west window. Juxon inserted the present plain mullioned windows – some in the position of C15 or C16 ones, for the splay of the north nave one has a pre-Reformation painting (see below). 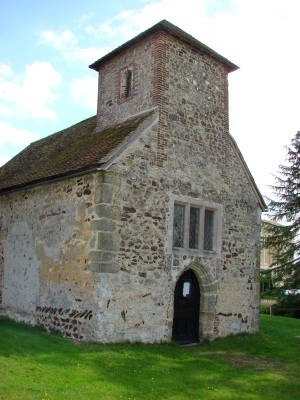 The south and west walls were probably largely rebuilt for a plain belfry with brick quoins is built into the west gable. Inside, it rests on a round-headed arch on a brick base. The roof with braced crownposts probably also dates from 1636, though it is mostly concealed by boarding. It would be easy to assume that Burton church escaped the C19 unaltered, but in fact quite a lot was done, though the extent of the work in 1851 is not known. More was done in 1897, after a tree fell on it in a storm (WSRO Par 32/12/1), but this was probably more in the nature of straightforward repairs. Sir D Hall, the occupant of Burton Park, was then involved, though probably as a donor rather than a designer. Either then or or more probably in 1851, a three-light east window with a square head and pierced spandrels was inserted. Compared with the C17 work, it is pretentious, though this is mitigated by the use of the easternmost tiebeam of the roof as a lintel. The boarding of the roof probably dates from the same time. There has been little visible later work, except for the renewal of the west window, which had been done before 1976 (vidi) and thus predates a restoration that took place in stages between 1985 and 1998 (3 p10). Burton church stays in the memory because of the simply plastered walls and the fittings, whether pre- or post-Reformation. As an ensemble they are unparalleled in Sussex and though not complete, recall what many country churches looked like before about 1850. Altar rails: Like the communion table, these probably originate in 1636, though only the balusters appear to be older than the C19. Aumbries: (East wall) Two plain square recesses, the one to the south deeper, are almost certainly aumbries. Benches: (Nave) C16 bench-ends with linenfold panelling. 1. See monument 3 below. 2. (South side of nave) John Goring (d1521) (3 p7), though the name plate is missing. 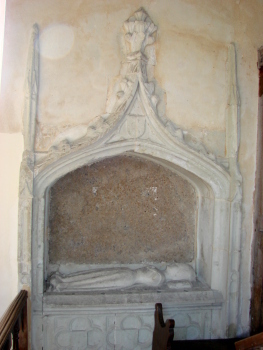 A small kneeling knight in a framed recess with panelled sides with shallow niches, above a plain tomb-chest. It has been described as London work (2 p304), though not assigned to any series. The slab in which it is set appears to be re-used. Font: Plain round tub, probably C11. The cruciform base is later and probably when it was added, the bottom of the bowl was cut to form eight sides that fitted it. 1. (Chancel) A small and previously unidentified female effigy of c1480 (Mosse p34) under an ogee-headed canopy with quatrefoils on the chest, which is flanked by pinnacles. It is now thought possibly to commemorate Elizabeth Dyke (2 p300). Unusually, the back is formed of Petworth marble, which is likely to be original (ibid). It is contained in a brick projection visible from outside and apparently patched later. 2. (Nave) Various coffin-plates of the Goring family. An error on that to Mary Goring (d1694) has been corrected as casually as a school exercise. 3. (North side of nave) Sir William Goring (d1553) and his wife Elizabeth (d1558). The shafts of the crested canopy have shallow incised renaissance decoration. However, it has a miniature pendant vault, the sides have Gothic panelling and there are cusped quatrefoils on the base. 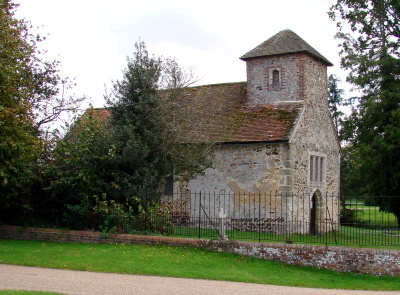 Though more modest, it is stylistically as mixed as contemporary monuments at Arundel (Fitzalan chapel) or Boxgrove. Instead of effigies kneeling brasses were placed on the back, together with seemingly randomly distributed coats of arms and inscriptions. These have been ascribed to the Nayle Group, an offshoot of Group G of the London workshops (TMBS 15/2 p178). The effigy of the man is missing, as are those of the eight children. The surviving female effigy is unique at this period as it shows a woman, Elizabeth Goring with a tabard over her dress, probably because she was heiress of the Coverts of Slaugham (Visitation of 1562 etc p46). 1. (East splay of the north nave window) A robed female saint crucified upside down on a diagonal cross, probably early C16. It has been suggested that this depicts St Wilgefortis (possibly derived from virgo fortis) who is known by a variety of popular names throughout Europe, including St Uncumber in England. According to legend, she was a Christian Sicilian or Portuguese princess around 130 AD who refused to marry the man chosen by her father as she wished to become a nun. Her father had her cast into prison, where she prayed to be made so unattractive that no man would marry her. Her wish was granted and she grew a beard, which so enraged the father that he ordered her to be crucified like Christ, whose heavenly bride she aspired to be. The legend became popular from the early C15 in the Netherlands and the cult was strongest in western Germany and the South Tyrol; the saint is said to have inspired particular devotion among men seeking release from their wives. The identification has been questioned (3 p9) on the grounds that the original legend of the saint does not mention crucifixion. However, she is in fact almost always shown crucified in German representations (for more details German-speakers are referred to M Knauf: Das “mannweibliche Crucifix” von Kirmutscheid in der Eifel, Rheinische Heimatpflege 3/2014 pp199-206), though none of the crucified figures found there is shown upside-down. This could be an accretion to the legend by analogy with the crucifixion of St Peter in this position to stress his unworthiness and need not cast doubt on the identification with St Wilgefortis, which is otherwise much the most plausible interpretation. 2. Various C17 black letter biblical texts, including the Commandments above the screen. Piscina: (South chancel wall) Small depressed headed and possibly C13. It may originally have been free-standing (3 p4). 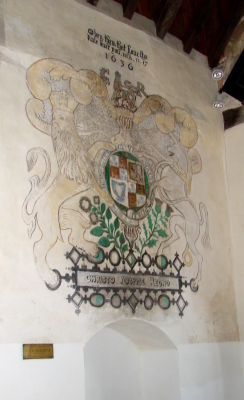 Royal Arms: (South wall) Painted on the wall. These are dated 1636, though as late as 25 November the lack of any had been recorded in the survey of that year (SRS 98 p30). Above them is the then topical injunction from Hebrews 13, verse 17 to ‘Obey them that have the rule over you’. Screen: C15. Either side of the opening are four thin ogee-headed openings. The crenellated top supported the rood and retains traces of original colouring.